Upholstered furniture brings a certain sense of classical style with it. Not to mention the fact that they are super comfortable. People who want to redecorate their house and want to buy all new furniture often gravitate towards upholstered furniture first because of its durability. But more often than not, this type of furniture is inherited from older family members or friends who are moving away but don’t want to take their furniture with them. When that happens, you might feel a moment of satisfaction at owning such a unique piece but it will immediately turn to dread when you realize that the furniture needs to be thoroughly cleaned before you can start using it. Well, we are here to tell you that you can stop dreading the inevitable. Upholstery cleaning is not as difficult as most people make it out to be. You just have to know how to handle a few things. Keep on reading to find out how can clean your upholstered furniture to make it as good as new without damaging it. Here is the thing. When you spill or drop things on most types of upholstered furniture, they are soaked inside and in most cases, dry on the surface. You can actually feel the dried up stains if you run your hand over the furniture. You can use a large spoon or a scrapper to get to it before moving on to the next step. You need to get rid of the external components. That would be the dirt, dust, grim and yes, even dead skin cells. Some people actually try to beat furniture to get rid of the dirt. Well, it doesn’t work. When you hit the furniture, the dirt and dust dissipates in the air. This affects the air quality of your house and most of it lands back on the furniture anyway. The dust and dirt can also trigger allergies. You can avoid all this by simply vacuuming. Make sure that the vacuuming is thorough though. You can either buy a special detergent from the market that is specially designed for upholstery or you can make your own by mixing baking soda, liquid dish washing soap and water in a bowl. You can use a blender to get the foamy texture. Use a hand brush to scrub over the larger stains and a toothbrush for the smaller ones. Make sure you dig in. When you are done, leave it for an hour. Use a clean cloth and cold water to wipe away the detergent. Do not, under any circumstance, drown the furniture in water to wash it. Depending on the thickness, the furniture can take up to a day to dry completely. It pretty much goes without saying but you should avoid using it for that duration. Wet furniture attracts dirt, so make sure that you keep it out of places where it will get dirty again. 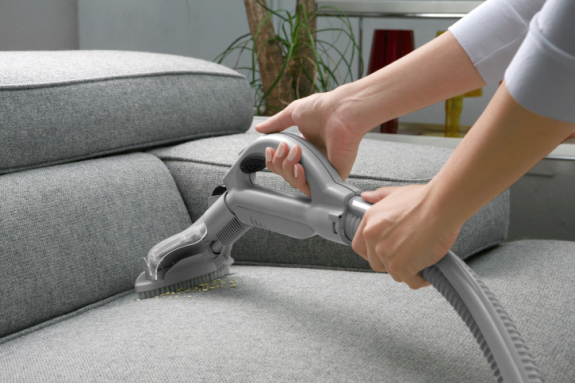 To have your upholstered furniture cleaned from top to bottom, you can also call us. Apart from upholstery cleaning, we specialize in mattress cleaning, water damaged carpets and so much more. To avail our services, contact us right now!